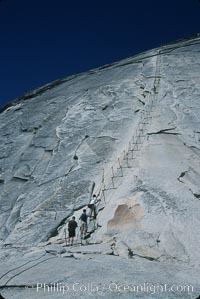 Half Dome is the one feature most closely associated with Yosemite National Park. A vast lobe of Mesozoic-era granodiorite magma cooled to rock, Half Dome was gradually uplifted to its present altitude of 8842 ft. As the rock was exposed, weathering and exfoliation of shell-like outer layers of the rock shaped the dome portion of the rock to its current shape. The summit is easily attainable as a day hike in the summer, if you have the stamina to undertake a 17-mile roundtrip hike with 5000 feet of elevation gain from the valley floor. To say that the view from the summit is worth the effort is an understatement.